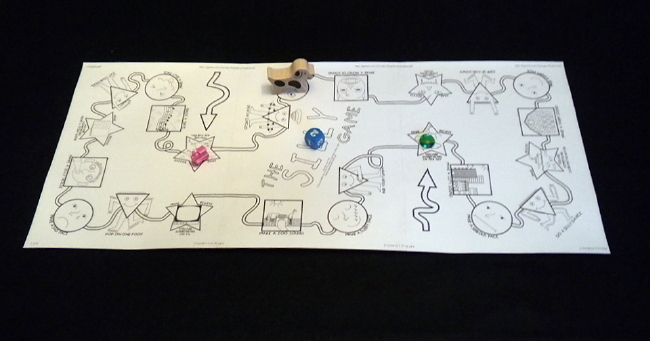 An educational game that lets kids act silly and encourages imaginative game play. I love to create games. One day, when I was working on a card game called Alpha Playing Cards, my two young daughters who couldn’t read that well at the time said, "Why don’t you make a game we can play?" So, to get them out of my hair for a little while I had them help me create a game. I gave them some coins for their playing piece, and a die. One of my daughters preferred to use a doll shoe for her playing piece instead, and then my other daughter had to find something to be her piece. I had them help me color in the game, which they enjoyed doing and also made the game a little more colorful. Originally The Silly Game was just a lot of circles attached together to form a never ending chain. Written in each circle was something that a player had to do when she landed on it. My plan to get them out of my hair wasn’t quite a success, but we did have a lot of fun that day. We made a few revisions since the first game, but the idea behind the game is still there. Now there are four categories designated by four symbols. Circle-make a face, Square-make a sound or noise, Triangle-do an activity, and Star-make believe you are something. Players move their pieces around the board and do what the spaces say. There is a picture in each space that goes along with the activity. The first player to land on two of each of the four categories wins the game. My copy made from the graphics here. Note: It still needs to be colored in with some crayons, but that's part of the fun.